Johann Peter Heinrich was born 1874 in Norka, Russia, the son of Ludwig Heinrich. Peter immigrated to the United States with his parents and siblings, arriving in New York on December 8, 1886 aboard the steamship America, with a group of people from Norka. By 1920, Peter was living in Portland at 334 Shaver Street and he worked in the icing department at a cracker baking company. Peter joined the First United Mennonite Baptist Church founded by Heinrich Helser who was succeeded by Heinrich Reisbich. Both of these men were also from Norka. According to Kevin Enns-Rempel, archivist at the Center for Mennonite Brethren Studies in Fresno, California, the Portland Mennonite Brethren Church was made up mostly of Volga Germans, and was therefore culturally different from the larger Mennonite Brethren Church. For many years, the congregation lacked strong resident leadership and for some years, ministers from the church in Dallas, Oregon preached regularly in Portland, as often as every other Sunday. Ministers Peter C. Hiebert (1907-1908) and Heinrich S. Voth (1909-1915) often filled the void. Kevin Enns-Rempel found documentation in the archives that a lame baker, a single man named Peter Heinrich, would regularly send a long green box with two layers of cookies home with Rev. Heinrich Voth after his weekend in Portland. According the PDC yearbooks, Peter Heinrich served as the lay leader of the church from 1913 until 1926, often with an ordained preacher or two and a deacon. By 1926, church membership had declined to 10 people. Peter moved to Fresno, California where he married a woman named Barbara and worked as a farmer. In 1930 and 1940, he lived next to George B. Hiebert, a minister and evangelist, who was very possibly a relative of Peter C. Hiebert. 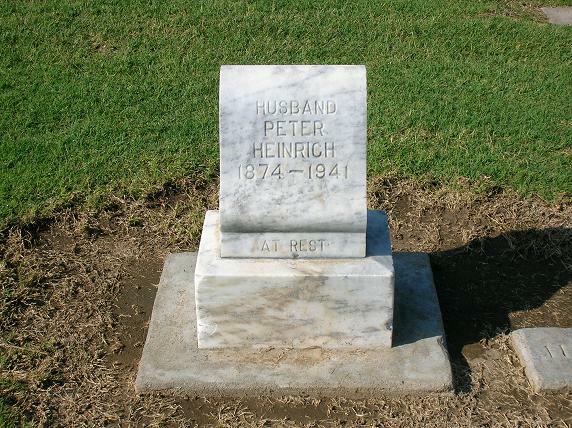 Peter died in Fresno in 1941 and was buried at the Reedley Cemetery.